Pretty cool. Just awesome sailing right now in perfect conditions, and the Hawaiian Islands are coming up fast. And there is more: from Wednesday morning at 8 am to Thursday morning 8am, Hula Girl covered more miles than any other boat out here, with the exception of the big Icon. That’s pretty impressive for a team that never sailed together before, and never sailed this boat before. In fact, most of the crew didn’t even know each other two weeks ago. 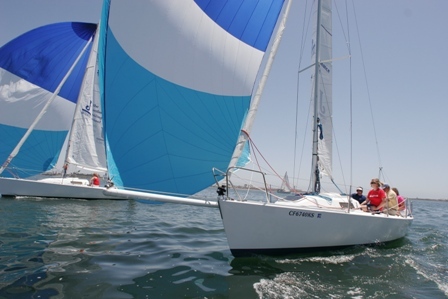 They came from all around the US and Canada to race in the 2012 Pacific Cup from San Francisco to Hawaii. Add to the mix three coaches from J World Performance Sailing, and you have Team Hula Girl. In the course of an event like this, we (coaches) work hard to try to get everyone aboard to do all the heavy lifting. Everyone is an equal team member, and gets equal time doing all the jobs onboard an offshore racer, from trimming to grinding to driving. I’m not going to candy-coat anything. It can be really rough going for the first couple of days. The crew is learning the boat and getting acclimated to onboard life in the toughest possible setting: an actual offshore race on a real offshore boat competing against numerous grand-prix level teams. And it’s not uncommon that we get fairly beat up by the competition in those early days. But then something pretty cool happens. The team gels. They learn how to drive the boat better, the early signs of being too high (or to low) and how much to respond. How the pitch and roll and yaw of the Pacific swells effect the boat and the sails. The trimming gets crisper, faster to respond to the driver and the wind. The team goes from being re-active to pro-active. The boat sails ‘in the groove’ longer, smoother, faster. Case in point: yesterday. As mentioned before, Team Hula Girl did an impressive job posting high miles and gains (some significant) on many teams out here with pro sailors, long term programs, and seasoned vets. Nicely done!! We are about 100 miles out right now, on the final push to the finish. We are expecting a fifth place in our class, and a fifth place overall. Not too shabby. And, what’s even better, is that it’s shaping up to be one final beautiful evening. We’ll have a waxing moon, and mostly clear skies. With about 14 knots of breeze, we are surfing small swells under spinnaker at about 12 knots. Tonight, as we run towards Kaneohe Bay on the north shore of Oahu looking at an early morning finish, I am really proud to have sailed with everyone on this team. Not only did they do a truly fantastic job, but they were also an absolute blast to be with. Many thanks to coaches Geoff (the Governor) and Chris (the Dude) for their tireless efforts and keeping the proverbial ‘wheels on the wagon,’ and of course thanks to Tom (the Tominator), Tim (the Bishop), Les (Field Marshal Serge), Brendan (the Cowboy), Martha (Trixie), and John (Bux Money) for making this such an enjoyable and memorable passage. http://sailing-jworld.com/jworldwp/wp-content/uploads/2015/01/Header-Logo.gif 0 0 jworld http://sailing-jworld.com/jworldwp/wp-content/uploads/2015/01/Header-Logo.gif jworld2012-07-28 03:53:002015-01-05 19:31:28ALOHA! Well it’s been a wild couple of days in the 2012 Pacific Cup. Early Tuesday morning, we entered a solid band of breeze which lasted for about two days. Winds were moistly 20-25 knots, with occasional squalls pushing things to around 30. Hula Girl was dancing with the waves, ticking off prolonged runs at 15, 16 knots and occasional leaps over 20. Just a complete blast, but nerve wracking… the squalls come on fast, and last a loooong time. You see the darkness come up behind you. Then you feel the rain. Then the wind is on you, the boat literally takes off, and your sleigh ride has begun. You’d better bring your A game. But we have taken some lumps too. We blew up a kite (my favorite 2A). We broke a gooseneck pin (good on the sharp eyes of Tim for noticing it before it became a big issue). We got some debris (polypropelene line… fishing gear??) caught on the prop and strut, then later caught a sheet down there… had to drop the kite and park it for a bit to clear the.tangle. We broke an after guy (that was ‘exciting’). And so on. Radio chatter indicates that more than a couple boats have has issues, but luckily nothing sounds too major. Once again, the J125 Double Trouble tore things up. Icon, the speedy Perry 66 did 273 miles yesterday. DT a little over 40 feet, did 300. That is absolutely rocking. THey are only 40 mile behind the big boat today. Could they actually beat Goliath and capture a clean sweep??? It would be an amazing accomplishment… so be sure to stay tuned. Other than that, Medusa the SC52 pulled on us, California Condor gained a bit (as expected), but we pulled on every other boat out here. Daily corrected standings haven’t been sent out yet, and there are still 650 miles to go… can we put enough time on Swazik and Hana Ho to correct out over them?? Lord know were gonna try. We are all on port tack , finally, more or less pointed straight at the Islands. A bit of a drag race now. Life onboard has been nice. Today is the first day with good sunshine, so we still have a lot of wet sails and gear. But it’s a lot warmer now, and we are drying out nicely. I’m about to head to the cockpit to take a nice warm shower (oh yes, I very much need it), and our bellies are full from the gourmet wraps that Martha made for lunch. Then I’m going to take a nap and recharge the batteries for tonight. The night have been challenging, and even though the wind is a bit lighter at the moment, I have comer to expect the unexpected. Cheers all, and wish us good speed and fortune on the sleigh ride to the barn! It’s a little after 3 am out here in the middle of nowhere. Well, actually we aren’t in any proverbial nowhere, we are out in the beautiful Pacific Ocean on a fantastic evening., so that part might be a little misleading. But the middle part is wholly accurate: we have just passed the halfway point in the 2012 Pacific Cup race from San Francisco to Hawaii. Out here, right now, we are farther from any speck of dry land than you can get anywhere else on the planet. 1035 miles, if you want to be exact. So if ‘somewhere’ for you equates to terra firma, then I guess indeed we might be in the middle of nowhere after all. Out here we are pushing into the tradewinds where the breeze comes on stronger and steadier. Earlier, the sliver of a moon pushed thru the patchy clouds, a welcome sight after a couple of dark dark nights out here. The way the reflected light plays off the water in a shimmery streak off the side of the boat which masks the speeds we are hitting as Hula Girl surfs, then loads up on the back of a wave, then surfs again. The darkness can almost fool you into thinking that we are stationary, a snapshot with all the trappings of speed, but frozen… unless you look down and see the water rushing by, or hear the hissing of the searing past the hull, or catch a glimpse of the spray thrown by the bow. Then it’s pretty clear we are trucking along. The moon has set now, and it;s all stars. I just spent an hour driving. It’s just glorious out there. I snuck the earbuds in and fired up the tunes. It’s about my favorite thing in the world: driving a fast boat with the kite up at night on shuffle play. It will never get old. It’ wont be getting light out here for a while… we are somewhere between Pacific TIme and Hawaiian time, where civic distinctions don’t exist and the mariners only deal with their own language, differences from Zulu, GMT, and the like. Life is good aboard… we are having a blast. Great company, great sailing, great competition. We have been underway a little over four and a half days, with about 4 to go, if we are lucky. But who am I kidding…. we are already lucky. Ok, that was close, but I’m back…. So our fleet is mixing it up a bit. Double Trouble, the J/125, has punched out nicely on a southern line, and is currently sitting in first in class, first overall. California Condor was down there too, but thru the night they reached up and are now north of us, near the smoking SC52 Medusa. Meanwhile, we have maintained a bit of leverage to the south. The breeze we are seeing out here for the past two days does not at all match the forecast models, so we have been paying increased attention to the NWS weatherfaxes and, even though they don’t match the reality out here, they are closer. If we had to guess (and we do), we’ll roll the dice that it will be a bit lighter and lifted to the north, so for now, we like our position relative to the competition. But there’s a lot of racecourse left… and plenty of time to keep us humble! Life onboard has slipped into a fine downwind routine. Sleep, trim, drive, grind. Rinse and repeat. As everyone gets more time in the various roles, our sailing just gets better and better. Driving is smoother. Trimmers are more active. Boat is faster. All good. And a special tip of the hat to Martha, who currently holds the speed record of a blistering 17.4 knots! Nicely done!! Well, what can I say? It’s all been pretty straightforward in the 2012 Pac Cup so far. We are now into day two and scooting along. The daily run yesterday was a mediocre 215, but not horrible given the conditions that plagued the area earlier in the week. So I am definitely not complaining. As of the 8am roll call on Friday, we were 5th in class, 5th overall in our extremely competitive fleet… Medusa, the SC52 with a full contingent of talented crew punched out to claim an early lead in class and overall. And with Swazik, Double Trouble, Condor, and the rest, the team rosters read like a who’s-who of West Coast racing. This is going to be a tough fleet. Most of the day yesterday was spent reaching with the Code 0. We saw Condor with their spinnaker up off our starboard side, but over the course of the afternoon they dropped down below us to the south, and eventually disappeared overt he horizon. Their heading was WAY south and I wasn’t comfortable with that, so we kept reaching with the Zero. In the late afternoon the breeze had not yet shifted to the north and had come up to about 14-15 knots, so we dropped the Code 0 and went back to the Jib Top and GS, which we carried thru the night. First light. Breeze shifting right, to due north. That can only mean one thing in a Hawaii race: Spin-time. We went straight to the 2A, and with a bow pointed almost directly at the Islands, took off at about 11-12 knots in about 16 knots of breeze. We are riding a wave of new pressure onto the course, coming into the fleet with the new breeze. This should mean that we are closing with the smaller boats ahead of us very quickly, and that we are in for a good amount of unstable wind. And sure enough, it’s been shifty and puffy, but the team has been handling it well. At the 8am roll call today, we found we had snuck into 4th place. Encouraging news for the team, even if the early standings don’t really mean too much (1600 miles to go!). Well to the north are Swazik and the other SC50, while well to the south are the J125 Double Trouble and Condor. Interesting to note that the leader is way south. Second place is in the middle. Third place is in the north. And fourth back in the middle. So there seems to be a lot of potential lanes out here, but as I said, it’s still very early. What I do know is that we have a bit of a drag race going, and we need to sail the boat well to keep up with these guys. Freeze dried lasagne for dinner tonight, and probably a bit of salad. Then into our first night with the kite up. It’s pretty clear today (patchy clouds) but not much of a moon so it will be a dark one. Beautiful right now, 15 knots and flat seas, and we are looking forward to a fun evening. Yes indeed. We here aboard J World’s Hula Girl in the 2012 Pacific Cup are feeling a bit lucky, and we aren’t even 24 hours into the race yet. We’re not sure how we sit in the standings, we aren’t sure this breeze will hold, we aren’t sure about much at all, in fact, except this one thing: we are sure that we were able to get away from the California coast a LOT less painfully than our brethren aboard the smaller boats that started before us! Pure luck of the drew, to be sure, but still we are happy we didn’t hit the hole they found. Some of those boats did a fantastic job punching thru it… nicely done… now we have to catch them. It was a mild departure from SF Bay yesterday. Maybe 15 knots out the gate. Mostly flat water at the end of the flood. We started with a #3 and full main, and kept good company as we tacked out the channel and into the band of fog offshore. We were happy to still beholding good breeze, as we watched the ghostly shapes of the other racers alternately disappear, and then re-emerge from the patchy low clouds. Finally, we all punched out the other side and were in clearing skies with good visibility. Past the Pilot boat sitting out by the SF Buoy. Past the Farallone Islands. And into the blue Pacific. Icon, the biggest boat in the race, punched out to an early lead. We won’t be seeing them again. The SC52 Medusa was straight in front of us, with the Swan 45 about even to the north, the other SC50 off our hip to the north, and Condor plus the two J125’s were drawing a line to the south. But I expect it all got shuffled last night. The breeze went right (as expected) in the early evening, and about 11pm we awoke our new crew to their first middle-of-the-night-you-must-be-kidding-me sail change. Smooth as silk, and we were on our way with the Blast Reacher and Genoa Staysail. We carried that thru the night, but just a couple hours ago this morning, the breeze started to back down a bit so we shifted up to the Code 0 (with GS). All good now. Doing 9 knots or so pointed in a very good direction in about 10-11 knots of breeze. We expect this to be building into the afternoon, so hopefully we can get the Hula Girl back into the double digits boatspeeds. Life aboard is great. It’s been mild, which lets our team acclimate to the new-to-them boat, and their new-to-them crew mates. We have run a couple full rotations, so everyone has had a bit of dance time with the Hula Girl. It’s always nice to get comfy before the spinnakers go up. That’s all I got for now (less than 20 hours into it, after all!)…. but I’ll fire away with more details as we get deeper into the race. * J World’s Hula Girl is the offshore training program for J World Performance Sailing School. We enter a number of grand-prix sailing events each year with a mix of our professional coaches and a crew of amateurs from around the world. To learn more, visit www.sailing-jworld.com. Thanks to all those who helped us get to the starting line! We appreciate the support, efforts and generosity of all those who have made it possible for the individuals and our company to get Hula Girl to the starting line for the 2012 Pacific Cup. First, to the friends and families of our customers and coaches who support their loved ones’ pursuit of offshore adventure! Thank you! Thank you to the management and staff of the Waterfront Hotel and Miss Pearl’s Restaurant and Lounge. They provide phenomenal hospitality to our out-of-town participants and go way, way, beyond to welcome our customers and support J/World at Jack London Square. Miss Pearl’s generously hosted our team for a send off on Tuesday. The pizzas were delicious and you gotta love their hurricanes! If friends, family or you are coming to the Bay Area, please check them out. Thank you to Atlantis Weathergear for their outstanding support of our efforts to share our passion for sailing. This year’s team is sporting Atlantis’ Watch Jacket in their crew photo. Thanks also to Dan and the team at West Marine Alameda. They go “over and above” anytime we need something, but especially in assembling the bulk of our crew gear. Thanks to Wally and her team at Autobahn Cafe for not only making great sandwiches (meticulously wrapped in “halfs” with condiments on the side!) but the extras: organic hard cooked eggs, fresh artisan bread, and “homemade cookies for happy sailors.” Wally and her team are special. Kincaid’s at Jack London Square welcomed our crew with an extended happy hour on Monday and Keith and Tammy from CCK (California Canoe and Kayak) raised a glass (or two) to support our team. (as well as a providing a few last minute necessities for the crew). Thank you to our safety gear partner Spinlock, Harken and Team McLube for keeping things moving with their Sailkote and Onedrop products.Apologies to all those I have not mentioned here! There are many others! http://sailing-jworld.com/jworldwp/wp-content/uploads/2015/01/Header-Logo.gif 0 0 jworld http://sailing-jworld.com/jworldwp/wp-content/uploads/2015/01/Header-Logo.gif jworld2012-07-20 16:43:002015-01-05 19:33:10Thanks to all those who helped us get to the starting line! Sylvia Seaberg fired the starting gun at 1:50PM yesterday and J/World’s Hula Girl was off to Hawaii! The team got a great start on starboard, close to the San Francisco shore in order to stay out of the last of the flood tide. They tacked to the Golden Gate bridge on port, ducked a boat and road the ebb out. Winds were in the mid-teens at the start, but the crew were set-up from the dock to switch to a larger headsail once the met lighter winds West of the Golden Gate. As the gun went off at 1:50 PM., J/World’s Hula Girl started the 2012 Pacific Cup! Crew photo at the St. FYC. http://sailing-jworld.com/jworldwp/wp-content/uploads/2015/01/Header-Logo.gif 0 0 jworld http://sailing-jworld.com/jworldwp/wp-content/uploads/2015/01/Header-Logo.gif jworld2012-07-20 16:43:002015-01-05 19:35:32And They're Off! J World San Diego !!!! Well, things go full circle indeed. I started teaching at J/World in San Diego years ago, back when the late great Larry Klein owned the shop and was racking up wins in some of the most prestigious sailing events in the world. I still remember fondly the summer when he (and my good buddy Ron Rosenberg) won the J/24 Worlds, the Etchells Worlds, and the Dragon Worlds (yep, all in one summer!). That pretty much cinched the Rolex Yachtsman of the Year Award for him. But I’m getting off on a tangent. J World San Diego. One of the best year round sailing venues in the world. Beautiful harbor, great So Cal weather. A fun fleet of boats. All good. So good, in fact, that I am thrilled to report that we here at the main offices running J World in San Francisco and Puerto Vallarta, Mexico have just bought the San Diego location! JWSD is one of the most respected maritime educational facilities in the world, and has touched tens of thousands of sailors through the years. 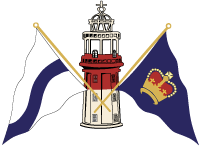 If you are a sailor, you probably know more than a couple of our alumni. We are excited to be the new custodians of this institution, and to maintain, and expand upon, the great and proven programs. Having another base on the West Coast will also fit in nicely with all the offshore cruising and racing events we do… and adding another J/120 to the fleet means we’ll be able to step up the offerings. Anyway, more info coming soon. Just wanted to share the good news. 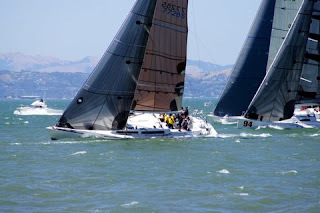 Right now, we are pretty busy getting ready for the 2012 Pacific Cup race from San Francisco to Hawaii starting next week. Man, when it rains, it pours. Race reports coming soon… all will get posted here directly from Hula Girl. 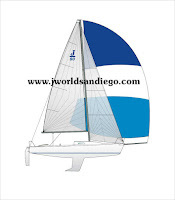 http://sailing-jworld.com/jworldwp/wp-content/uploads/2015/01/Header-Logo.gif 0 0 jworld http://sailing-jworld.com/jworldwp/wp-content/uploads/2015/01/Header-Logo.gif jworld2012-07-10 21:35:002015-01-05 19:33:07J World San Diego !!! !